Motorcycle and snowmobile helmets protect riders from serious or fatal head injuries. Motorcycle and snowmobile helmets share the same purpose: to protect the rider or riders from serious or fatal head injuries. Helmets also protect riders from the elements, such as wind, rain, snow, surface debris and tree limbs. Motorcycle and snowmobile helmets are used interchangeably by riders even though there is a difference between them. These are full-face helmets with a visor on top of the helmet for extra protection from surface debris and tree limbs. The top visor precludes the use of a face shield, so goggles need to be worn with this type of helmet. For motorcycle riders, this is an advantage, because it allows air to circulate around the driver's head and cool it from the strain of motocrossing. For snowmobilers, snug-fitting goggles and a balaclava will offset the cold protection of a face shield. Full-face helmets are available for motorcycle and snowmobile riders. They are similar to motocross snocross helmets. The main difference is the lack of the top visor. This allows both types of riders to use a face shield. Face shields protect the riders from wind, glare and insects. Full-face helmets also protect the lower face and chin from injury. Open-face helmets lack the chin guard full-face helmets provide. These helmets do provide coverage for the forehead, cheeks, ears and the back of the head. Insects, wind, tree limbs and debris can injure a rider's face and cause discomfort, which leads to fatigue. 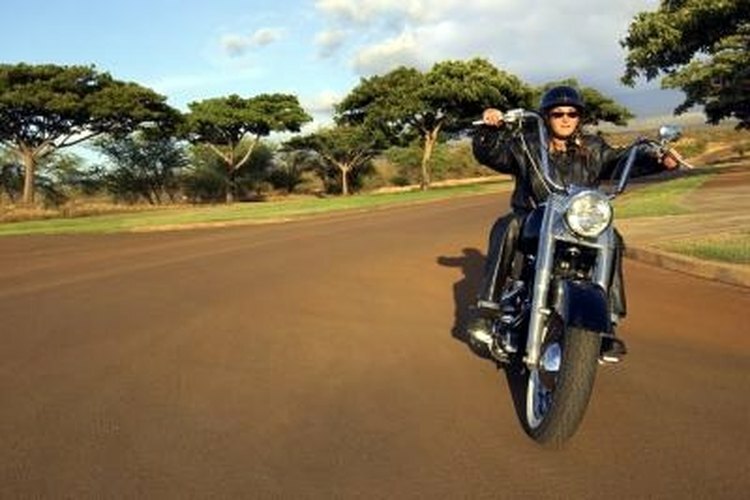 Some states require open-face helmet users to wear goggles or wrap around sunglasses to offset this. Open-face helmets can also be fitted with a face shield for extra protection from the elements. Snowmobilers have a problem with face shields or goggles fogging up, something motorcycle riders rarely encounter. Snowmobilers have three options to overcome this problem. Some full-face helmets come with a breathing box to help divert the rider's breath from the shield or goggles. There are double-pane goggles and face shields available to snowmobilers. Some face shields and goggles can be electrically heated to prevent fogging. William Brown started writing in 2008, covering financial services, government services, health-care reform issues and technology. He has obtained the Financial Industry Regulatory Authority Series 6 and 63 licenses for variable contracts. Brown holds a Bachelor of Arts in sociology from the University of Virginia. How Does a Snowmobile Work?